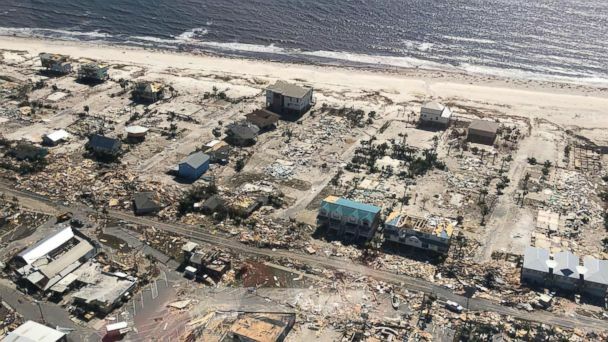 Hurricane Michael, a ferocious and historic storm, has killed at least 13 people, left a "tremendous number" of others unaccounted for and left a trail of destruction across Florida, Georgia and the Carolinas. Michael is the fourth most powerful storm on record to hit the U.S., and the worst since Hurricane Camille in 1969. It is also the first Category 4 hurricane to ever make landfall on the Florida Panhandle, and "the worst storm" that area has ever seen, Florida Gov. Rick Scott said. The hurricane blasted into the Florida Panhandle Wednesday afternoon, demolishing homes and submerging entire neighborhoods. ABC News chief meteorologist Ginger Zee said the ruins in Mexico Beach, Florida, were "eerily reminiscent to the scene I saw in Gulfport [Louisiana] in 2005," after Hurricane Katrina. In Mexico Beach "a tremendous number of people" are "unaccounted for," Mark Bowen, chief of emergency services in Bay County, which encompasses Mexico Beach, told "Good Morning America" Friday. Rescuers' top priority Friday is a "meticulous" search process, Bowen said, "everything from looking for bodies to looking for injured persons." The U.S. Coast Guard has rescued more than 60 people an assisted nearly 300 by Friday evening, it said in a press release. After Florida, Michael roared through Georgia, sending a tornado through the tiny town of Roberta, near Macon. Roberta residents Wayne and Sharon Granade told ABC News they ran inside, slammed the door, got under a couch and held each other. "It comes through like the worst sound you've ever heard in your life," Wayne Granade said. "It started throwing stuff everywhere." "You hear the train noise and it sounds like bombs exploding," Sharon Granade said. "I was crying ... It was really scary ... you can hear the trees breaking." "Worst situation you can be in," Wayne Granade added. "Everybody thinks it ain't gonna happen to you. But it happened to us." Michael then barreled into the Carolinas, dumping over 9 inches of rain in North Carolina where residents are still reeling from historic flooding left by Hurricane Florence last month. The Carolinas were followed by Virginia, where the weakened storm still wreaked havoc, flooding roads, downing power lines and killing at least five. At least 13 people lost their lives in the massive storm. Four people died in Gadsden County, Florida, said a sheriff's office spokesperson. In Georgia, an 11-year-old girl, Sarah Radney, was killed when part of a metal carport crashed into her family's trailer in Lake Seminole and struck her in the head, local officials said. Her official cause of death was due to massive blunt force trauma, Seminole County Coroner Chad Smith told ABC News. Michael is the first major hurricane to blow into Georgia since 1898. There were five deaths in Virginia, four of which were from drowning, state officials said. The fifth death in the state was Lt. Brad Clark, a Hanover County firefighter, who was killed while helping at the scene of a car crash Thursday, according to Hanover Fire-EMS and Virginia State Police. In North Carolina, a 38-year-old man was killed when a tree fell onto his car as he was driving, Iredell County officials said. Two others also died in North Carolina, according to The Associated Press. FEMA Administrator Brock Long on Friday warned that the death toll will likely climb. "I hope we don't see that climb dramatically, but ... we still haven't gotten into some of the hardest hit areas," he said. The Florida Panhandle is the wide strip in the northwest corner of the state bordered by the Gulf of Mexico to the south and Alabama and Georgia to the north. Its largest city is Pensacola, with a population approaching half a million. Popular with tourists for its beaches, the area also has many year-round residents. Michael left the coastal community of Mexico Beach destroyed, with the storm surge ripping multiple houses from their foundations, sending them bobbing along the main road that runs through the town. ABC News' Ginger Zee said she saw an "entire home, a well-built home, rolling down the street." "It makes you shake," Zee added. With cell service knocked out, many people are isolated. There are now empty spots where dozens of homes are no longer standing. Florida Sen. Marco Rubio tweeted he was hearing "stunning" reports of damage, including that "Mexico Beach is gone" and the "damage in Panama City is catastrophic." He described Mexico Beach as an "old old Florida town" that "feels like a trip back in time," and Panama City as "a vibrant seaside city" popular for families and students to vacation. "It will take a long time to recover from this. We will do everything we can to make sure the federal government does it's part," the senator tweeted. "But I will confess that my biggest fear that this part of Florida, with its unique & genuine characteristics, will never be the same." Thousands fled the Florida coastline before Michael hit. But by Wednesday morning, it was too late to evacuate. Those who remained were urged to shelter in place. "It sounded like a freight train coming from every direction," Krista Miller, who stayed behind in her 111-year-old home in Apalachicola Bay, told "Good Morning America." Colleen Swab, her mother and her young daughter took shelter in a closet in Panama City Beach, Florida. "We were terrified but there was nowhere for us to go. We couldn't get on the roads. It was too late," Swab said. "I thought the roof was going to come off. I don't suggest trying to ride out a storm." Tyndall Air Force Base, located 12 miles east of Panama City, suffered "severe damage to the base infrastructure," the Air Force said. No personnel assigned to stay there during the storm were injured, the Air Force added. As cleanup and rescue efforts were underway Thursday, Gov. Scott urged residents to stay off the roads. "The worst thing you can do now is act foolishly" by putting yourself in danger or keeping law enforcement from saving lives, he said at a news conference. Michael has left more than 1.3 million households and businesses without power across Florida, Georgia, Alabama, South Carolina, North Carolina and Virginia. More than 33,000 workers have been mobilized to help restore power, officials said. The government is urging anyone in a disaster zone to check on their neighbors. "Right now, what we need is neighbor helping neighbor," Long, the FEMA Administrator, said in a statement. "We deploy resources and responders, but we know often times it is neighbors who are the first people to help those in need." President Donald Trump has approved major disaster declarations in Florida and Georgia. Residents can register for federal assistance at disasterassistance.gov. Michael "grew into a monster," Trump said Wednesday from the Oval Office. Despite the storm, Trump went to his Wednesday night rally in Erie, Pennsylvania. "We have thousands of people lined up. ... It would have been very unfair," Trump told reporters when asked about whether he was thinking of canceling it. He later spoke about the hurricane during the rally. "Our thoughts and prayers on behalf of the nation to everyone out there in the path of Hurricane Michael," Trump told supporters Wednesday night. Trump said he will visit Florida and Georgia next week. "We are working very hard on every area and every state that was hit - we are with you!" he tweeted Friday. ABC News' Ginger Zee, Anne Flaherty, Kenneth Moton, Will Gretsky, Julia Jacobo, Meghan Keneally, Victor Oquendo, Jason Volack, Morgan Winsor and Scott Withers contributed to this report.